MSRP: $24.95 USD (~$34.06 CAN/ € 20.60 EUR) plus s/h, available from the Specialty Press. 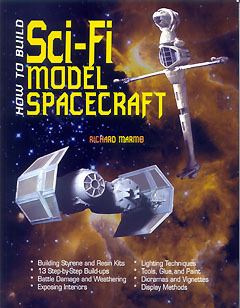 There's never been a really good general introductory reference specifically intended for sci-fi model builders, at least one that covered a wide gamut of subjects and techniques. Paul Newitt's StarFleet Assembly Manuals came the closest, though they concentrated strictly on AMT Star Trek kits and were out of print for a very long time. Most of us picked up references for airplane or armor models and applied what we learned to sci-fi. A year or so ago, I sat down to write that general introduction for sci-fi builders. I even got several chapters done. But Richard Marmo beat me to the punch - and his book is almost everything I wanted mine to be, so there's not much use in continuing that project. Mr. Marmo is a professional model builder and a prolific author. He's built every kind of model and written hundreds of articles, and was a founding member of IPMS/USA. This book is filled with the experience of a lifetime building models. 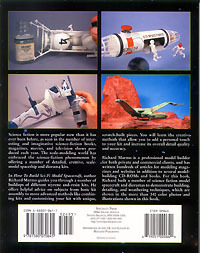 In it, he guides the reader through a number of step-by-step projects, well-illustrated with color photos, showing the tools and techniques necessary to build detailed, accurate spacecraft and vehicles from all the different media (plastic, resin, etc.). His writing style is direct, to the point and conversational (and thankfully never condescending or confrontational). Introduction: A brief overview of the genre, and an explanation of why the models used as examples were chosen. Chapter 1: Tools, Paint and Glue: This chapter presents an overview of basic tools, adhesives and paints available to most of us. It's not as detailed as it could be, but generally sufficient for an introductory text (for instance, airbrushes are described in a paragraph that essentially says they're good tools and you probably want one. Later on in the book, he goes into more details of using them, at least). Chapter 2: Styrene Kits: Here's where it starts getting good. Three models are used as examples. Each one is described from start to finish, with all the basic assembly, apinting, decalling, weathering and finishing steps outlined along the way. This is a great start for the novice, and good refresher material for the more advanced builder. Chapter 3: Working with Resin: This chapter follows the assembly of two SMT kits, describing all the techniques used with resin/multi-media kits. If you've been afraid to try your hand at resin, this chapter will dispell those fears. Chapter 4: Dioramas and Vignettes: This contains a good, short introduction to displaying your models in a context. There's a lot of good, basic information here - though not as comprehensive as (say) Shep Paine's diorama bible, it'll get you started off right. Figures and some "battle damage" techniques are also discussed. Chapter 5: Bare Metal or Painted Plastic? The title is a bit of a misnomer; tis chapter mostly covers the fine art of masking and painting complex finishes (in this case, Star Trek's USS Defiant). Only the most general overview of bare metal finishes are described, and only one technique - spray paint - is shown. No mention of foil, metalizers, etc. By contrast, the section on complex finishes is pretty thorough, with a goodly amount of time spent on masking techniques. Chapter 6: Advanced Detailing: In this chapter, simple lighting effects are covered, followed by a description of how to make a model with removable parts (in this case, Polar Light's Spindrift with its complete interior), and then a discussion on battle damage. Some more diorama techniques are also included. Chapter 7: Advanced Kit Building: This is basically a discussion of how to build multi-media kits, along with some simple scratchbuilding. Captain Cardboard/Custom Replica's One Man Spacepod is the subject. Chapter 8: Display Methods: This chapter discusses simple ways to make bases for your models. Chapter 9: References: The last full chapter quickly covers various places to find reference material, retailers and manufacturers. Again, it's not as detailed as it could be (no URLs for the websites listed, for instance) and the Appendix that follows is not very comprehensive. Still, as an overview, it's sufficient. Clear, concise, and lavishly illustrated: what a how-to book should be. Mr. Marmo has written an excellent introductory reference. It's not always as detailed as I would (personally) like, but what's covered is more than a very good starting point. While it's most useful for folks just starting out, or returning to, the hobby even experienced builders will find useful information. Many thanks to Specialty Press for providing the review sample. Manufacturers and retailers, interested in getting your wares reviewed and publicized on a site averaging 3500+ readers a day? Contact us!